SLC 500 Retentive Timer (RTO) Operation and Uses. The SLC 500 Retentive timer (RTO) keeps total track of time. Initially, when the rung goes true, the accumulated value begins to increase. When the rung goes false, the accumulated value stops increasing. The next time the timer goes true, the accumulated value picks up where it left off. Our accumulated value will continue to increase (in this manner) until the accumulated value reaches the preset. At this point, the Done (DN) bit is set. The Retentive Timer is useful for keeping total track of machine run hours for maintenance. 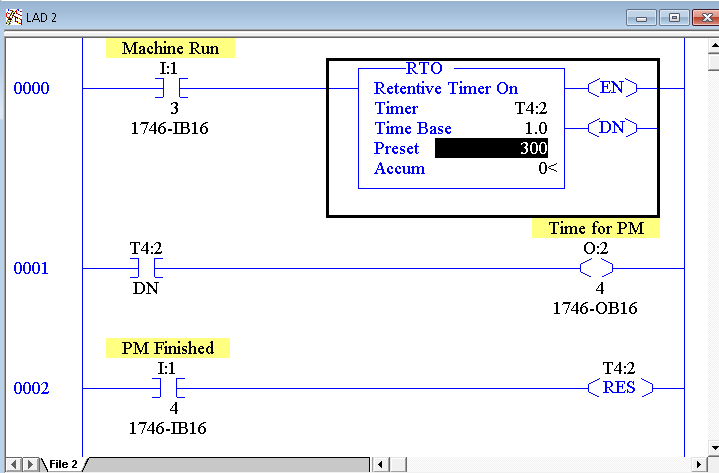 We can then display the total run hours on an MMI (Man-Machine Interface). Another example would be an automatic lubrication system. After a certain amount of run time, the automatic lube system can be initiated. We also use the RTO for PM (Preventative Maintenance). 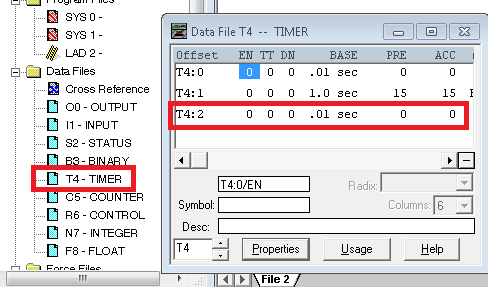 Before adding the RTO, I always like to make sure there are plenty of timers available in the T4 Data file which have not been used. To do this, I’ll open the T4 File, and then click “Properties”. You can set up as many timer elements as you like (Up to 255). In this case, I just have 3 timer elements, and T4:2 is unused. I’ll add some logic, so we can see the operation of the timer. For this example, we’ll use I:1/3 as our switch that turns on the equipment. After 5 minutes run time, we will energize a light (O:2/4). This light indicates that it’s timer for PM. After the PM is done, we can press the button (I:1/4) to restart the Retentive Timer. The Maximum time that you can have on a timer is 32767 seconds. That is the limitation of a 16 bit signed integer. If you need more time than this, you can have the RTO instruction count to one hour only. After one hour, trigger a counter instruction, then reset the RTO for the next hour of run time. The accumulated value of the counter would represent the total machine run hours. For more information on the SLC 500, please visit the SLC 500 Category Page!